The world's first color home video camera was developed by Toshiba in 1973. Today, home video cameras can easily obtain high-quality color video signals, and are widely used throughout the world. Back in the 1970s, however, engineers at Toshiba struggled to develop a compact camera that could acquire the three primary color signals from only one image pickup tube. 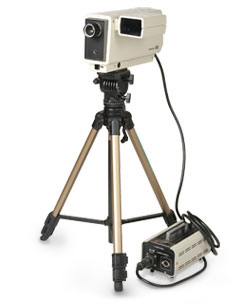 At the time, large and expensive color video cameras were mostly used in television stations, although similar cameras were also used for educational and medical purposes. Those cameras employed a three-tube method, by which three camera tubes created image signals through an expensive optical prism that divided incident rays from an object into the three primary colors: red, green, and blue. The threetube method made it extremely difficult to put color cameras on the home market, because a single camera required three costly camera tubes and complicated adjustment technology to accurately overlap the three color images. To realize a home-use video camera, it was necessary to make a compact camera using a single tube. The engineers therefore decided to use a frequency multiplexing method. Frequency multiplexing extracts red, green and blue signals by changing the pitch of two different color stripe filters. However, this method requires high-resolution camera tubes which, although they were used in specific applications, were too expensive for home-use color cameras. So the engineers tried various other ideas. A new frequency interleaving method, which placed color filters at an angle diagonal to the line scanning direction, was invented. At the same time, Dr. Norikazu Sawazaki and other engineers at Toshiba Research & Development Center developed a helical video tape recorder (VTR). As in the helical VTR, if color filters could be placed at an angle to the scanning direction, the three primary colors would be able to be efficiently obtained. The best way to achieve this was through frequency interleaving, which allowed different frequencies to be shared with luminance signals. In addition, a single frequency could be shared between two color signals if the frequency interleaving method was used. Compared with the conventional method, which simply multiplexed red and blue signals in the frequency bandwidth, frequency interleaving was an innovative method for efficiently utilizing various frequency bands. The next step was to incorporate the color stripe filter into a camera tube for mass-production. Most camera signal processing circuits used semiconductors, whereas camera tubes were still of the cathode-ray type. They were called vidicon tubes, and their operating properties continually changed–as though they had a life of their own–depending on their temperature and age. In addition, it was very difficult to maintain consistent color image quality because characteristics varied from tube to tube. Product design had started from scratch in order to launch the color version of the home-use video camera on the market, and cost reduction would help to achieve this goal. So a special development, design, and formulation project was organized, in which the researchers determined which technologies would be most suited to mass-production. 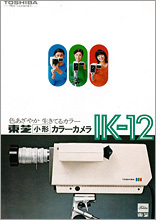 Production became possible in the summer of 1973, and the world's first one-tube color home video camera (model IK-12) was commercialized in 1974.